"All 23 episodes from the sixth season together as a standalone season set for the first time. Guest stars in Season Five include Laurence Fishburne, Jeffrey Tambor, Michael Richards and many more. 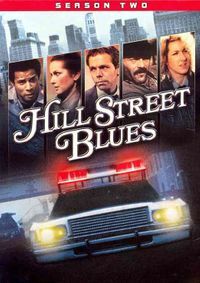 A cop show hailed for both its inspired lunacy and remarkable realism, Emmy Award winning Hill Street Blues is a humanistic and comical look into the daily grind of a police squad in New York's Greenwich Village. Beginning in 1981 and continuing for seven acclaimed seasons, the unforgettable cops of this unnamed American city put their lives on the line for the better of their city. From numerous gang-related crimes to robbery and drug trafficing, the cases these cops dealt with were matched only by their own personal lives! Starring: Daniel Travanti, Taurean Blacque, Bruce Weitz, Joe Spano, Kiel Martin, Betty Thomas, Michael Warren. Charles Haid and Veronica Hamel."